Professor Celia M. Marr MRCVS of Rossdales looks at Matter of the Heart – diagnosing and assessing heart murmurs. 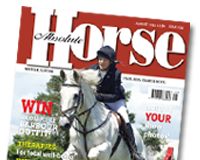 While many horse owners’ hearts will sink on hearing the news “your horse has a heart murmur”, this news is often not quite as bad as it first sounds. The heart is a very efficient organ and minor changes in heart function may have no impact at all on the horse’s quality of life or its exercise tolerance.